Joslin, a recent industrial engineering grad from Penn State University, credits her work with the baobab project for her new gig as a manager at Procter & Gamble. Penn State students developed a machine to process baobab fruit for a cooperative in Africa. After volunteering for the project in 2011, Joslin started in the machine shop. She took trips from 2011-2013 but on the first trip, one of the five boxes that held the giant processor’s parts didn’t make it, a failure that had two positive results. First, she said, the designers spent time talking with the women who used mortars and pestles to grind the fruit, gathering valuable feedback. Second, they realized the futility of building something that would prove difficult to service and maintain. The machine, which at that time was 5 feet tall, 6 feet long and weighed 250 pounds, needed to be produced in Africa so farms and cooperatives could find spare parts. 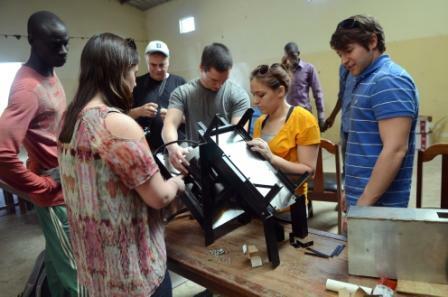 The thrill of technology transfer continued in January 2013, when Penn State engineers journeyed to Senegal and Benin to give the processing machine to its intended recipients. Workers in both countries were excited to learn how to use and maintain the technology. As she has grown with the project, she has learned how to manage multiple disciplines, from mechanical to chemical to biological engineers, and get them to step back from their immediate tasks to focus on the big picture. Future teams will keep incorporating feedback from the Africans into newer and better machine designs, a process that already has reduced the machine to a manageable size of 22 inches. In other words, the baobab processor has gone from being taller than Joslin to a size where she can hold it.